William Shakespeare wrote a number of romantic comedies of which As You Like It is the finest. A romantic comedy is a play in which the romantic elements are mingled with comic elements. While the romantic elements like delight and thrill enchant us; the comic elements make us laugh. Thus a romantic comedy is a marvelous kind of play which appeals greatly to our emotions, our imagination, and our fancy and which at the same time appeals to our risible faculty. The romantic elements in this kind of play transport us to a new world which is more pleasing than the actual world in which we live, and the comic elements make us laugh and forget our cares and anxieties. As You Like It keeps us laughing most of the time, despite saddening incidents, the laughter is aroused in us by Rosalind, Celia, Touchstone, Jaques, William, and Audrey. There are several features of the play which justify the description of it as ‘romantic’. The very mingling of serious and sad events and situations with amusing scenes and situations is romantic. The ancient classical plays and the neoclassical plays of the later time were either purely tragic or purely comic. But Shakespeare did not hesitate to introduce comic situations and comic characters in his tragedies, and sad happenings and pathetic characters in his comedies. Thus in As You Like It the banishment of Duke senior, the no lent quarrel between Orlando and Oliver. Duke Frederick’s shabby treatment to Orlando and the banishment of Rosalind are all sad happenings. But the play creates an outstanding effect of comedy which provides much amusement and mirth to us. As You Like It is a romantic play also by virtue of the fact that it does not observe any of the three dramatic unities namely the unity of time, the unity of place and the unity of action. The unity of time demands that the action of a play should cover not more than twenty-four hours while the action of As You Like It occurs over a period of at least days. The unity of place demands that the entire action of a play should occur in the same town or a place or any other place. But in As You Like It the scenes shift from the city to the forest of Arden, from the forest of Arden back to the city, and then again to the forest of Arden. The unity of action demands that a play should have a single plot and should not contain any subplots or under plots, in As You Like It we have as many as three sub-plots, besides the main plot. In other words, As You Like It has a loose structure. However, the most striking romantic element in the play is its theme of youthful love and the passion of love that has a universal appeal. Rosalind falls in love with Orlando at first sight and he falls in love with her at the same instant. The love of Celia and Oliver too is a romantic affair. They too fall in love with each other at first sight. Phoebe’s love for Ganymede has also a romantic basis. The play is romantic also in its setting. Barring a few scenes, in the beginning, the story of the play has been sent to the Forest of Arden, in rural surroundings. The atmosphere at the court and in the city is always suffocating not only because of intrigues and jealousies prevailing there but also because of the crowds of people. Here in the Forest of Arden one may have to face rough weather and icy wind but here one is at least safe from the dangers of overcrowding and the dangers of the insincerity of the people. The Forest of Arden stimulates all the faculties of a human being, especially the heart and the feelings. Moreover, there is something romantic about the attachment of Celia to her cousin Rosalind when Duke Frederick goes away after saying that his decision of exile sentence to Rosalind is final and irrevocable. Celia takes the initiative and says that she would accompany Rosalind into exile. Such affection is really heart touching, similarly, there is something romantic even about the loyalty and devotion of Adam to Orlando. 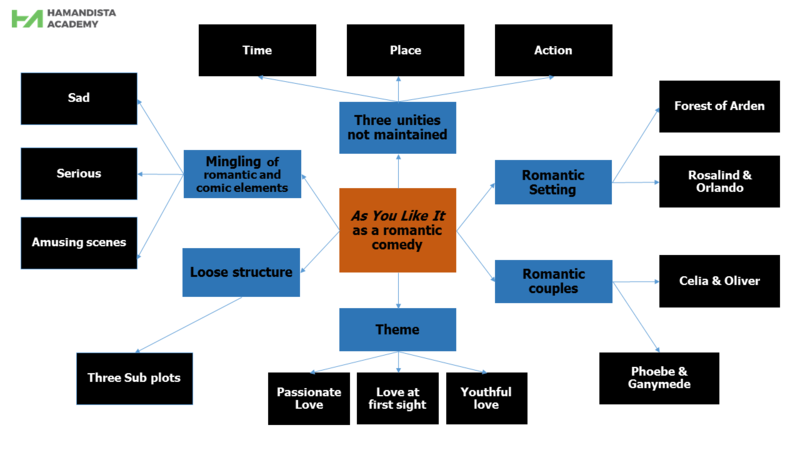 In As You Like It romance and comedy are mingled in an effective way. The play’s effect is poetic, not satiric throughout the play we find an aura of freshness, radiance, and beauty. Indeed it is a perfect romantic creation of Shakespeare. Now have a look at the picture below to get the summary of this article.